How is club foot treated? Club foot is a term that describes a range of unusual positions of a newborn's foot. It can happen in one foot or in both feet. An ultrasound done before the baby is born can sometimes detect club foot. But it's more common for a doctor to diagnose club foot after the baby is born. Sometimes the foot is flexible and can be moved into a normal position right after birth. In other cases, the foot is more rigid or stiff. This means that more treatment is needed. With treatment, most people who are born with club foot are able to live healthy, happy lives. You and your doctor will make a treatment plan based on your baby's needs. Club foot does not cause pain in a baby. But club foot will not straighten itself out. If it's not treated, the foot will stay twisted out of shape. And the leg that is affected may be shorter and smaller than the other. These symptoms become more obvious and more of a problem as the child grows. Your child may have problems playing like other children because of club foot. And he or she may have problems with walking and finding shoes that fit. But treatment that starts soon after birth can help overcome these problems. The foot, especially the heel, is often smaller than normal. The front of the foot may rotate toward the other foot. The foot may turn in, and in severe cases, the bottom of the foot can point up. All of the causes of club foot are not well understood. It can develop because of the position of the baby while he or she is growing in the mother's uterus. Having other health conditions such as spina bifida can also cause club foot. It can also be the result of problems that affect the nerve, muscle, and bone systems, such as stroke or brain injury. Shortly after birth, your baby may be tested for some of these problems. Treatment starts soon after birth. Your doctor may try putting a cast or splint on the foot or feet first. This means the foot (or feet) is moved into the most normal position and held in that position until the next treatment. Treatment is repeated every few weeks for several months. The foot is moved a little closer toward a normal position at each visit. Your doctor may do surgery if the cast or splint isn't working or if the foot is severely out of place. The most common surgeries repair ligaments and tendons, such as the heel cord (Achilles tendon). After surgery, a cast or splint holds the foot in place while it heals. Your child may have physiotherapy. 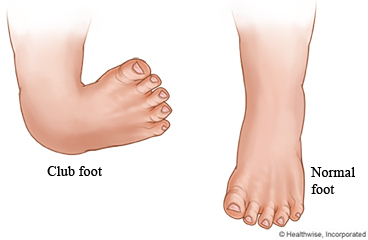 Enter G800 in the search box to learn more about "Learning About Club Foot".